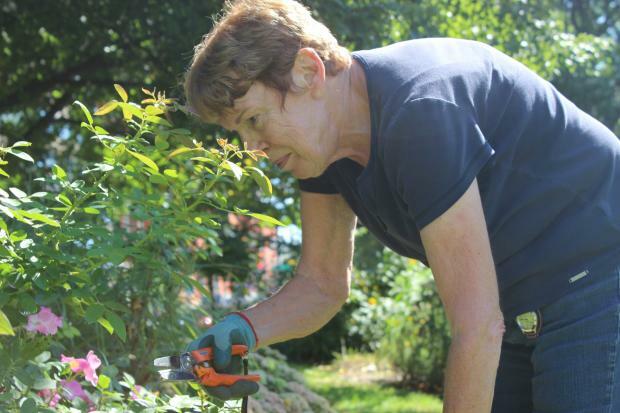 LINCOLN PARK — For more than 20 years, Judy Johanson has spent almost every Saturday morning from April to October pulling weeds, planting perennials and throwing out trash at Oz Park's garden. When she's not kneeling in dirt, the 74-year-old is applying for grants to pay for more upkeep or rescuing dying plants from nurseries to eventually bring to the garden. "The only thing the [Chicago] Park District does is mow," said Johanson, one of the founding members of the Oz Park Advisory Council. Johanson doesn't do it alone. Over the years, she's recruited a small group of women volunteers who are all equally dedicated to the garden. "It's our baby," said Kathy Jordan, the oldest member of the group at 75. Like Johanson, Jordan has been cleaning up the garden since it was established in 1994. The women even helped name it Emerald City Gardens in keeping with the park's "Wizard of Oz" theme. On a recent scorching hot Saturday, five members of the group, all in their 60s and 70s, convened at the garden for the weekly three-hour cleaning. In between plucking weeds and hauling them away, the women lovingly clipped back roses, lilies and other flowers and raked the dirt in a few of the garden's 17 beds. "When you work on it this long, you really care about it and you want to maintain its beauty," said Jordan, who has lived down the street for 40 years. The Park District has put some money into the garden over the years, but Johanson's advisory council is responsible for most of the beauty, raising thousands of dollars through grants and other fundraisers. Community organizations like the Oz Park Baseball Association have also helped raise money. Those funds allowed the group to hire a landscaping crew to do a fall and spring cleanup. According to Jordan, the garden used to be a horseshoe pit "that no one used." When asked what the garden would look like without the group's efforts, Johanson said it would look "like crap." Today, there are perennials in every direction (Johanson estimates they've planted a few hundred different types over the years), fluttering butterflies and benches to sit and enjoy it all. It's a quiet respite from the rest of the beloved park, which is always brimming with activity. But the women need a younger generation to carry on their legacy. "We really haven't had a lot of people step up to volunteer," Jordan said. Sometimes folks seem interested, she said, but those people rarely commit to the weekly cleanings. The women in the group are getting older and won't be able to able to garden forever — as much as they'd like to. "It's always a worry," Johanson said of the future of the garden. "That's why we'd like to recruit some younger volunteers that would be as anxious to take care of the garden as we are." To volunteer or donate, visit the advisory council's website. Kathy Jordan, 75, trims plants on a recent Saturday morning. Johanson estimates the group has planted a few hundred perennials over the years. The northern side of the garden.